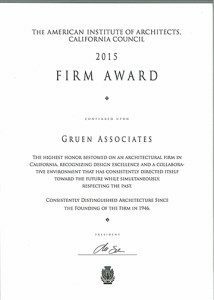 Gruen Associates was selected for the 2015 AIACC Firm Award by their peers in recognition of their expertise in collaborative practice, a portfolio of over 10,000 projects, and their contribution to architecture and pivotal role in mentoring future generations of architects. Awarded by the AIA California Council (AIACC) as the 2015 AIACC Firm Award Recipient, the award is the highest honor bestowed to firms who have a tremendous legacy in producing distinguished architecture, great depth and a cumulative effect on the profession, great breadth and influence, a collaborative environment that consistently directs itself toward the future while remaining respectful of the past, a culture that educates and mentors the next generation of architects, the ability to transcend specific areas of expertise making connections between areas, as well as being widely known to both architects and non-architects for the quality of its services. The AIACC is the largest component of the National AIA organization.